Bersatu chairperson Dr Mahathir Mohamad said his party will only admit former Umno members who have proven to have repented. In a video message uploaded to his Facebook page, Mahathir said former Umno members who wished to join Bersatu must prove they are longer "tied" to Umno. "When we are satisfied with their behaviour, they can join us but not as a large group which tries to take over Bersatu. "Bersatu cannot be controlled by anyone. 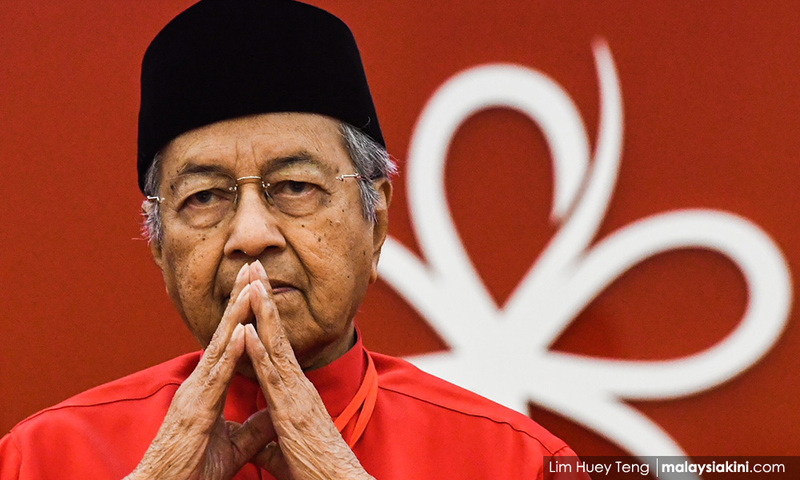 Bersatu is controlled by its mission," said Mahathir in response to a question on whether ongoing recruitment of former Umno members would result in an "Umno culture" being absorbed as well. Mahathir said Bersatu was established by a group of former Umno members who were disappointed by the last crop of leaders. He said more Umno members should have revolted had they truly held on to the party's principles. "However, they were influenced by (the notion of) 'Cash is king'. They didn't (leave). They stayed with Umno and in the end, their behaviour was rejected. "The right thing to do when they saw their leaders swindling (money), was that they should have gotten rid of that leader. "When that leader got rid of those who were straight, Umno members should have left as well. This would have caused the downfall (of the bad leader)," said Mahathir. He said the Umno of yore - the one led by Onn Jaafar, Tunku Abdul Rahman, Abdul Razak and himself - was a party based on race, religion and country. However, the previous administration of Umno was designed to benefit its leader while its party members turned a blind eye to the leadership's wrongdoings. "That to us is no longer Umno," he said. So far, Bersatu has admitted only one ex-Umno lawmaker - Mustapa Mohamed - who won on a BN ticket during the May 9 general election. Since May 9, the party has also recruited former Umno supreme council member Rais Yatim and is reportedly eyeing former Umno Wanita chief Rafidah Aziz.